Snack, Crackle, Pop. Repeat. I’ve said this before but Filipino food is on the rise, and much like many top chefs have predicted, Filipino food will begin to surprise you. If you have never had Filipino food, just give it a try. Granted, I have yet to find a sweet Filipino dessert that I like (but then again I do not like many desserts as I am not a sweet tooth), but the savory dishes are to die for. This one might be the one to top it off. There are many common, top, Filipino dishes that you might already be aware of such as Pancit, lumpia, or even Kare Kare, but there is one that is top notch, and that is lechon kawali. 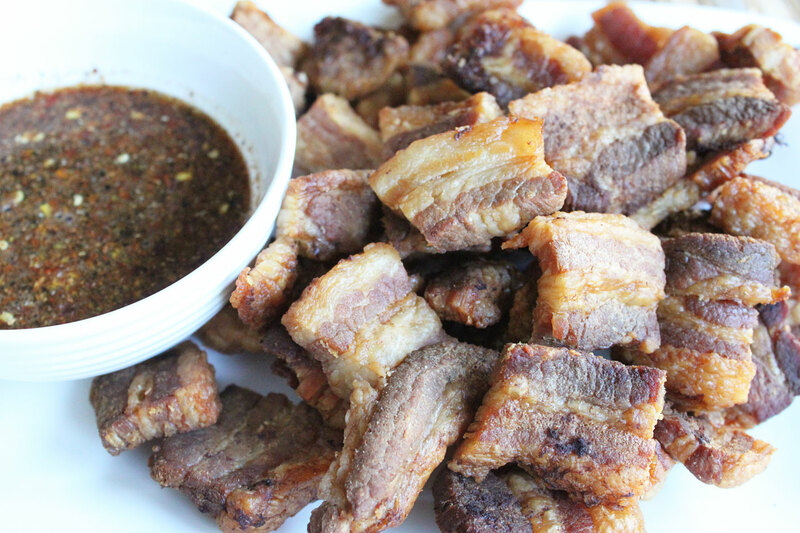 Your cardiologist may not like you after this, nor probably your primary physician, but in moderation, this Filipino crispy pork is so simple to make, and makes a perfect party food. 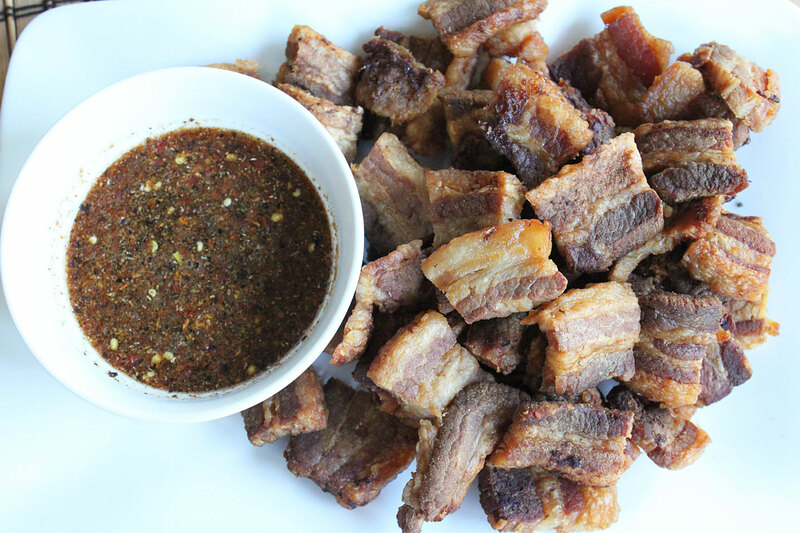 Traditionally made with pork belly, you can also try it with pork ribs just make sure you have plenty of fat to render on the second cooking cycle. Yep, there are two cooking steps going on here. I recently made this for my son’s birthday party, as well as another Filipino gathering and both times they rocked the socks off of the party guests. You know you’ve done right when the Filipinos are giving you a thumbs up, a hug, or a high five after eating your food. This is a winner. Start by adding the pork belly, garlic, bay leaves, peppercorns, soy sauce, and enough water to cover the pork belly into a large pot or dutch oven. Cover, and bring to a simmer, cooking for about 1 hour. This is to tenderize the pork, and infuse all of the great flavor from those aromatics. After 1 hour or so, get a baking sheet out and line it with a wire rack. Take the strips of pork belly and lay them on the rack, making sure any of the excess liquid goes back into the pot. Once the strips are laid out, lightly salt them with kosher salt. This will assist with the dehydration process and get them ready for the next step the following day, if not hours later in the day. Place the baking sheet, uncovered in the refrigerator. I do this over night. When you are ready to go with the next step, take the pork out of the refrigerator and cut them into bite sized cubes, about 1-2 inches in size. Go larger if you prefer. Heat a pot of oil, about 2-3 cups of canola oil, in a medium sized pot, and bring this to about 350-375 degrees. In batches, fry the pork. This should take about 5-7 minutes per batch. Once golden and the fat is rendered and crispy, remove with a slotted spoon or kitchen spyder and place onto a paper lined plate to remove any excess oil. Let the oil in the pot come back to temp, then repeat until the lechon kawali is cooked. NOTE: If you are frying these bad boys, make sure you reserve some for yourself because if you turn your back, trust me, these babies will be gone. This happened to me when I brought them to a party for our friend Miguel to chop up and fry. I didn’t even get a single piece! No worries on that part however, as I know that when I am snacking with the family, that I am sure to get a few pieces. And that dipping sauce? Go for it. The combination of garlic, vinegar, soy, and chili. That’s a whole other level when it comes to dipping sauce. If you are looking for a great party appetizer, and don’t mind frying with a bit of oil, this one is sure to please and is a real crowd pleaser not only for those wanting to try some Filipino flavors, but for those who love great, easy food. Hope you enjoy! 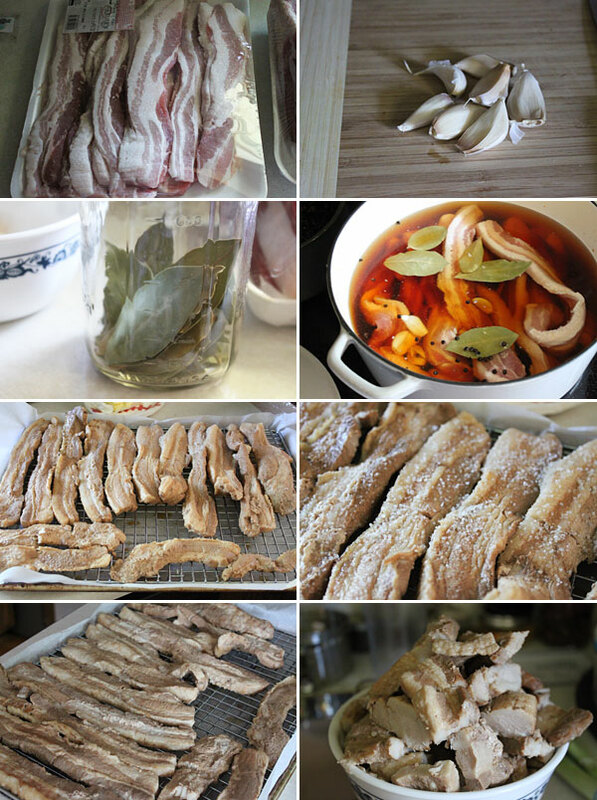 I’m making the Lechon Kawali right now. What do I do with the liquid the pork was boiled in? Keep it again in the freezer for next time or is there other things it’s good for? Hi Sue, were you able to figure out what to do? I actually tasted it and it tasted like it’d be great for a soup but then I got busy and forgot it! Oops. Threw it out. What a waste of a tasty stock. Darn it! I’ll know better next time. Husband adored the Lechon Kawali by the way! Never mind tonight I’ve made the your Thai Cucumber Salad so it’s already tasting great and ready to have with the Isan Grilled Chicken. It’s all brined and marinated so when husband comes home he can throw it on the BBQ(we are Aussies). We don’t have a coal burning one but the gas one picks up some pretty good smokey flavours over time plus I cheated and added a couple of drops of liquid smoke haha! 🙂 Can’t wait to try it all with some rice. I’ll post tomorrow after we’ve eaten how it all went down. I’ve pinned lots of your recipes! Want to taste way too many but I made myself a new year vow to cook more Asian food since we never get enough of it. Is there a way to read comments to what I post if there are any? It was just by luck I saw your question about the stock.